Most people I ask would like to accomplish more on a daily basis than they are able to. All too often we have challenges with those we work with that prevent that. 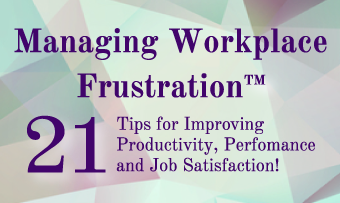 Sometimes resentment and anger hijack our brains and we brood and cannot focus on the tasks at hand. We may leave work unhappy that we got sucked into the drama and didn’t accomplish what we’d set out to do. To achieve our objectives, we all need “people skills,” and Daniel Goleman’s Emotional Intelligence Competencies model shows us exactly what those skills are. His model includes specific characteristics that determine our success in life—regardless of our definition of success. Goleman’s Personal Competencies include Self-Awareness and Self-Management, and his Social Competencies consist of Social Awareness and Relationship Management, and each category includes specific competencies like emotional self-awareness, initiative, empathy, and influence. For a complete list, go to www.advtrain.com/files/ei_comps.pdf . Finding a tipping point: Success requires expertise in each area, and a varied skill set in the attributes Goleman describes. For instance, it isn’t enough to be self-aware and fall short in relationship management or social awareness. Or, like some people, be politically astute but have no idea how others see them! As you look at the list of competencies, which ones are you good at? Which could use some shoring up? Do you have capabilities in all four areas? Have you met with obstacles or roadblocks in your career? Which of these characteristics could help you overcome a specific obstacle?